A flagship event to learn, connect and act on behalf of racial justice. Diversity and inclusion have a singular place among the values of Carnegie Mellon University. The Center for Student Diversity and Inclusion (CSDI) actively cultivates a strong, diverse and inclusive community capable of living out these values and advancing research, creativity, learning and development that changes the world. The Center offers resources to enhance an inclusive and transformative student experience in dimensions such as access, success, campus climate and intergroup dialogue. Additionally, the Center supports and connects historically underrepresented students and those who are first in their family to attend college in a setting where students’ differences and talents are appreciated and reinforced. The Center for Student Diversity and Inclusion sends out an eBulletin to students, other campus-wide affiliates, and the greater Pittsburgh community on a biweekly basis every other Monday. Sign up, and please invite members and friends of the CMU community to subscribe as well! The Center is a great space. 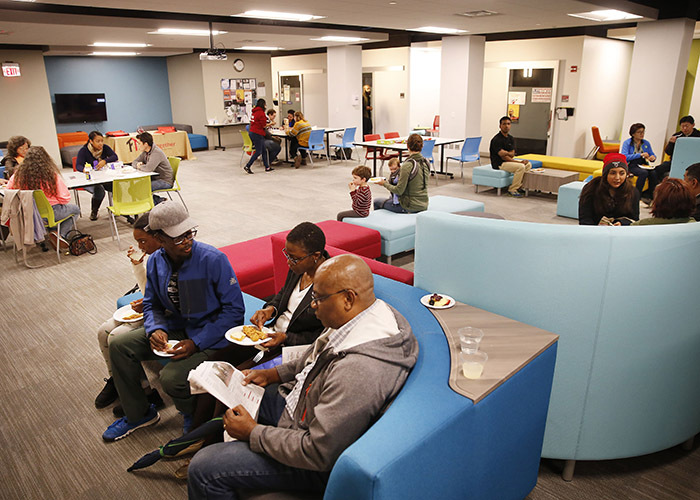 A centralized hub for students, this space provides an on-campus option for students looking to socialize, hold meetings, take a break between classes or study. The Center is a modern space capable of hosting large groups while simultaneously accommodating space for individual students looking for a quiet escape. Student organizations are welcome to reserve space in the Center, as well as utilize the space to foster intergroup dialogue and community building. The Center for Student Diversity and Inclusion is an environment focused on identity, belonging, campus climate and support. If you or your student organization would like to host an event or convene a meeting in the Center’s main space or conference room, please fill out our CSDI Space Reservation Form. If you reserve a space with us, we request that you read our Event and Meeting Space Reservation Policy, Guidelines, and Instructions before proposing an event.